Tea is love, tea is life. Big Train Chai Tea comes in 9 delicious easy-to-prepare flavors: Caramel, Chocolate, Green Tea, Raspberry, Spiced, Spiced Apple, Spiced Decaf, Vanilla, and No Sugar Added Vanilla. Can be prepared hot, iced, or blended into a refreshing chai smoothie! One case is four 3.5lb bags. $0.37 / oz. $0.35 / oz. $0.34 / oz. $0.32 / oz. Mix 1 scoop (3 Tbsps or 34g) of Big Train chai mix into 6oz (180mL) of hot water/milk/dairy substitute. Stir until dissolved and enjoy. Steam 4 fl. oz. (120 mL) of milk with 8 fl. oz. (240mL) of water to 160° F (71° C). Add 2 scoops (6 Tbsps or 68g) of Big Train Chai Mix, stir and pour into 16oz mug. 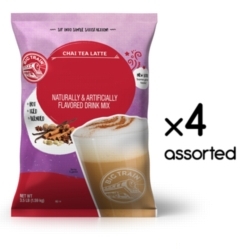 Mix 2 scoops (6 Tbsps or 68g) of Big Train Chai Mix into 5 fl. oz. (150mL) of hot water, pour over 12oz (180g) cup of ice, then add 2oz (60mL) of cold milk or dairy substitute, and serve. Pour 6 fl. oz. (180mL) of water/milk/dairy substitute into blender, add 2 scoops (6 Tbsps or 68g) of Big Train Chai Mix, then add 12oz (180g) cup of ice into blender. Blend until smooth. INGREDIENTS: sugar, nondairy creamer [coconut oil, corn syrup solids, sodium caseinate, sodium citrate, mono and diglycerides, salt, sodium aluminosilicate (anticaking agent)], nonfat milk, pumpkin powder (maltodextrin, corn flour, sunflower lecithin), tea blend (black tea & darjeeling tea), natural flavor, spice blend 9cinnamon, nutmeg, allspice, ginger, clove, cardamom, and anise), honey granules (sucrose, honey), salt, silicon dioxide (anticaking agent), guar gum, carrageenan gum, bourbon vanilla extract from Madagascar. INGREDIENTS: sugar, nonfat milk, coconut oil, corn syrup solids, black tea, natural & artificial flavors, honey (sucrose, honey), cinnamon, sodium caseinate, silicon dioxide (anticaking agent), sodium citrate, mono- and diglycerides, salt, sodium aluminosilicate, guar gum, carrageenan gum.